The historic agreement reached at Paris on climate change outlined a range of activities, research, and technical cooperation to mitigate climate change. Intended nationally determined commitments to reduce carbon emissions have been submitted by most countries. Financing to developing countries for climate change has been promised with a publicized target of at least $100 billion per year. But education receives relatively small amounts of aid compared to what has been promised for climate change. Today, aid commitments for education projects are about $13 billion annually. With this level of support there have been some gains in school enrollment especially at the primary level, but secondary schooling improvements have been modest. If one-eighth of climate aid could be devoted to more education, it would double aid for education and could potentially lead to far more rapid scaling up of girls’ education. The logic behind girls’ education as a climate mitigation investment is straightforward. The United Nations projects that the world’s population will grow from 7.3 billion today to 9.7 billion by 2050. Almost all this growth (2.3 billion people) will be seen in developing countries, where mortality rates have declined more rapidly than fertility rates. Africa’s population is projected to rise by 1.2 billion people, mostly in countries like Nigeria, Ethiopia, and the Democratic Republic of the Congo, but also in smaller countries like Uganda, Niger, and Mali, where fertility rates remain very high. The International Institute for Applied Systems Analysis (IIASA) in Vienna has done the most extensive modeling of the impact of fertility on population growth. In their scenarios, the impact of education is enormous. Better educated women have far fewer children than women with little education. There are huge differences between the fertility rates of women, depending on their education level. Fertility is the main unknown variable in demographic projections (largely ignored by the U.N.’s demographic model) and it depends crucially on the assumptions used for education growth. The difference between the high population growth assumption and low population assumption is 2 billion people by 2045 and over 5 billion people by 2100. Almost all of this difference depends on the assumption made about fertility. In Africa, IIASA thinks that improved education could result in 1.8 billion people less than the U.N. median variant suggests by 2100. If education could be scaled up faster, the impact would be even more dramatic. Will the world reach 10 billion people? Wolfgang Fengler and Samir K.C. In the low population projections, the assumption is made that all countries expand education at the fastest possible rate, with South Korea being the benchmark for what can potentially be achieved. The high population projection assumes that school enrollment rates stall and do not improve. IIASA’s median variant, which is still 600 million people lower than the U.N.’s median variant in 2050, assumes that all countries expand education at the average historical pace for all countries. Would it really make that much difference to global carbon emissions if there are fewer people? Yes. In the United States, for example, the carbon emissions of a single person is about 20 times the reductions that each of us might be expected to achieve by being more conscious of our carbon footprint, switching to electric cars and using LED lightbulbs. Does education really make that much of a difference to fertility rates, compared to other possible explanatory variables? Yes. 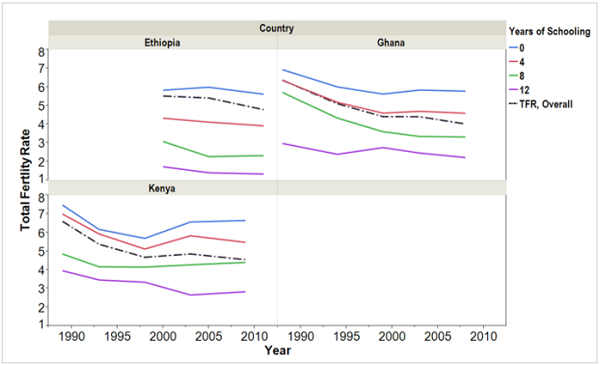 Look at the graphs below, taken from the World Bank, to see how dramatic the difference is in some selected countries. The difference between 0 years of schooling and 12 years is almost 4 to 5 children per woman. While trends are for women to have lower fertility over time (perhaps through access to family planning) at each education level, the main driver of overall fertility reduction is clearly the change in proportions of women at each education level. 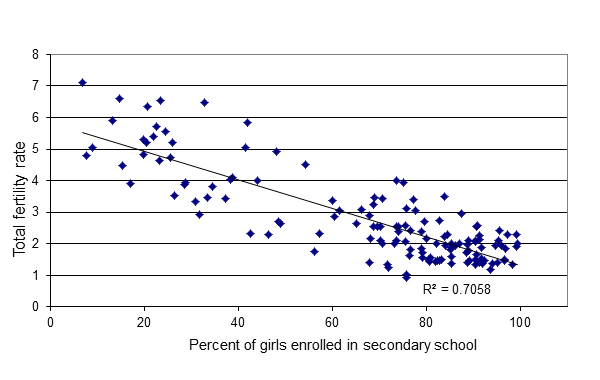 If you prefer more statistical evidence, look at the regression done by the Earth Policy Institute, showing a striking negative correlation with secondary schooling enrollment rates. The argument that education will have a beneficial impact on climate change is not new. Other researchers have made it before. Wheeler and Hammer (2010) conclude that “we find that the population policy options are much less costly than almost all of the options … for low-carbon energy development, including solar, wind, and nuclear power, second-generation biofuels, and carbon capture and storage. They are also cost-competitive with forest conservation and other improvements in forestry and agricultural practices. We conclude that female education and family planning should be viewed as viable potential candidates for financial support from global climate funds.” Population Action International has a map to link population growth and climate change hotspots. It notes that 37 out of 41 least-developed countries that have submitted national adaptation programs of action include reference to population pressures making for increased vulnerability. So what needs to be done? It is high time for policymakers to make the link between education and climate change, not just in theory but in their financing and programming decisions. One feature of the sustainable development goals is that they are an effort to cut across siloes. This is what now needs to happen between the education and climate community. The former are scrambling for funds; the latter for proven interventions. Secondary schooling for girls would put the two together. It should be part of every donor’s scaled up effort to mobilize resources for climate change and to allocate these resources in the most cost-effective way.